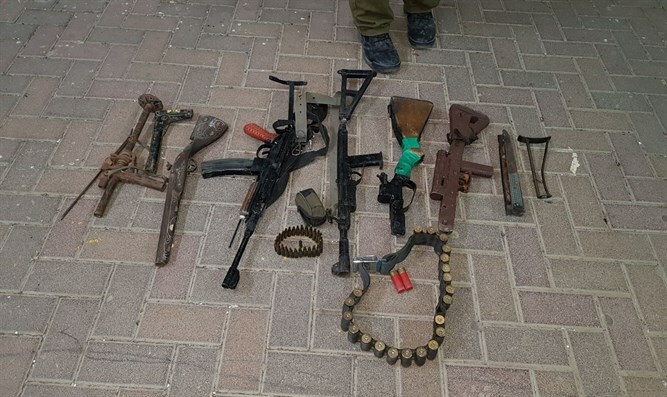 Border Police detectives working with the IDF on Wednesday night discovered an illegal weapons factory in the Hevron-area Arab town of Beit Arush. Authories suspect that the Arab manufacturer held a permit allowing him to cross into pre-1967 Israel. A search revealed five weapons, including a shotgun, Airsoft rifle turned into a Kalashnikov, and three homemade Carlo guns. Other weapons and equipment were found at the scene as well, including binoculars, IDF uniforms, and knives. A 40-year-old resident of Beit Arush was arrested and taken for interrogation. Israel Police note that the confiscated weapons may have been intended for use in terror attacks against Israeli citzens. Arabs who wish to cross into pre-1967 Israel from Judea and Samaria but do not have Israeli citizenship must apply for permits. The reason is usually in order to work, but since criminals and terrorists seeking to carry out attacks can try to join them, there is a need for permits so that each can be vetted and a record kept. Several other weapons were confiscated on Wednesday night, and fifteen terrorists were arrested.